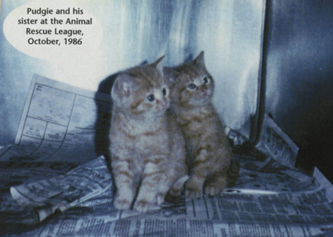 As the saying goes, “things happen for a reason” and I still don’t know the reason why I happened to stop into the Animal Rescue League on that cold winter day in 1986. That visit was the beginning of a journey that brought joy to thousands of people and memories that I will always cherish. I was in the area of the animal shelter and stopped in to look at dogs. I was thinking about possibly adopting a dog if I could find a nice one, but never considered a cat. I noticed two tiny kittens in a cage and as I stopped to look at them, the volunteer at the shelter walked by and said, “They are only seven weeks old but will be put to sleep in the morning if they are not adopted today.” As he said that, the one little kitten looked at me… something just clicked. “I’ll take that one,” I said, pointing to the little kitten. The volunteer handed the tiny kitten to me and he fit comfortably in the palm of my hand. I thought to myself, “What a pudgie little fellow he is,” and I decided to name him Pudgie. 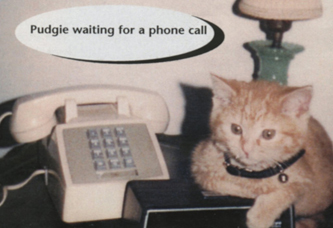 Any time that the phone rang, Pudgie jumped up on the table and knocked the receiver off the handle. I taught Pudgie to do tricks such as jump through a hoop, crawl through a box, and answer a small phone. As he mastered these tricks, I then taught him to golf, bowl, and kick a football! Pudgie loved to ride in the car. When I took him with me, he jumped up on the dashboard where he could look out the window. Since he enjoyed the car rides so much, I built a platform for him on the front seat with a small steering wheel and gear shift. Pudgie and I were always on the go; to the bank, the post office, the gas station. When Pudgie and I drove through town the townsfolk waved and smiled when they saw us drive by. The women at the bank always looked forward to Pudgie coming through the drive through window perched in his car seat. Once again, fate stepped in and opened a whole new world to Pudgie. I went to the Laurie Ann West Library in Fox Chapel to have my photo taken for my driver’s license. In the room next to the photo center was a preschool. While I was waiting for my picture, I struck up a conversation with one of the preschool teachers. As we talked I told her about Pudgie and his tricks, and she asked if I would bring him into the class for the kids. So Pudgie and I went to the preschool and he performed like a pro! He jumped through his hoop and the kids loved to see him bowl, golf, kick the football, and answer the phone. The teachers were so impressed that they invited us back. For the next visit they invited a reporter from the Pittsburgh Post-Gazette who wrote a feature on Pudgie for the paper. Pudgie was a celebrity! 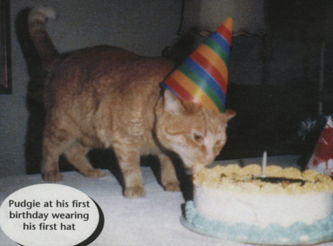 On October 16, 1987, Pudgie celebrated his first birthday. I bought him a cupcake and put a candle on it for him. I had a little birthday hat and I put it on his head. Surprisingly, he did not try to knock it off, but rather he seemed to enjoy the hat on his head. Since he did not mind his hat, I fitted him with a pair of small glasses without the lenses, and he kept the glasses on as well. Pudgie had a costume for all occasions. He has over two hundred costumes, fifty hats, and thirty pair of glasses. Every time he went out he was dressed for the occasion. As Pudgie grew, he grew to weigh twenty-three pounds. Often times I had to carry him at our appearances. To make it easier, I picked up a baby stroller for him. He enjoyed riding in his stroller with his hat, sunglasses, and outfit. The local television, radio, and newspapers soon began to follow the adventures of Pudgie the cat. Dave Crawley from KDKA in Pittsburgh called and asked if he could feature Pudgie on his “KD Country” segment. Crawley was so impressed with Pudgie that he referred to him as “Pudgie Wudgie the Wonder Cat” and from that point on Pudgie was known as “Pudgie Wudgie”. 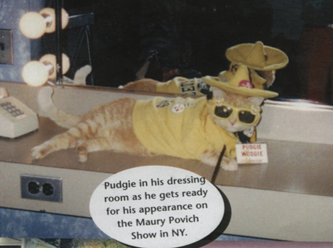 Pudgie Wudgie loved public appearances and the public loved him. He dressed in his ski attire and took to the slopes at Seven Springs Ski resort where he was a regular visitor form many events. 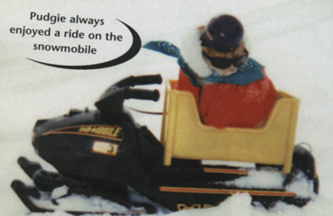 He enjoyed snowmobiling in the winter. He attended Steeler tailgate parties dressed in his own Steeler uniform. 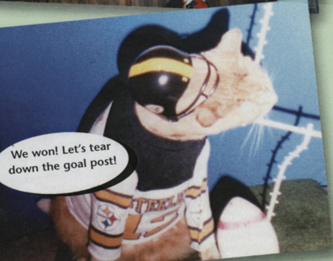 Pudgie often helped out by appearing at many fundraising events in Pittsburgh. Each Halloween he dressed up and went trick or treating. At Christmas time he wore his red Santa suit and on St. Patrick’s Day he wore his green leprechaun outfit. 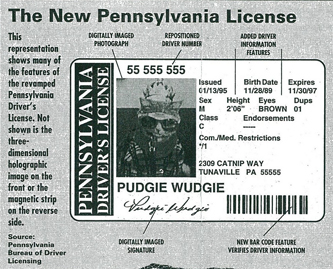 Pudgie loved amusement parks – he visited Cedar Point, Geauga Lake, Marineland-Niagara, and his favorite, Kennywood. 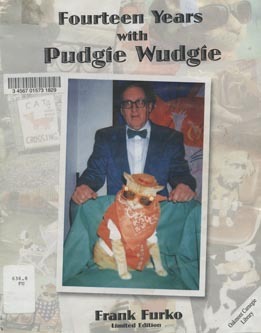 Pudgie Wudgie became an international celebrity. We traveled to New York City where he was featured on the Maury Povich Show. He was called to appear on David Letterman’s Stupid Pet Tricks, but that was one time he would not cooperate. I think he heard that it was called “stupid” pet tricks, and refused to do anything stupid! He visited Niagara Falls, New York City, and Milwaukee, Wisconsin. He had his picture taken in the “Memphis Belle”, the World War II airplane made famous in the movie. The National Enquirer did a two page spread on him. A reporter from Italy traveled to our house in East Oakmont and did a feature on Pudgie for Italian TV. He was also featured in a Turkish Newspaper. He was a regular guest on the news programs in Pittsburgh and was the subject of many newspaper articles. He was highlighted in the numerous cat magazines across the country. 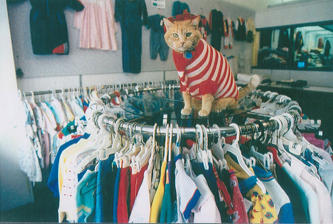 He debuted in his acting career in a commercial for Dad’s Cat Food which was broadcast nationwide. Pudgie rubbed elbows with many celebrities throughout his career. They included Chuck Noll, Ms. Pennsylvania, Olympic ski champion Roffe Steinroff, Patti Burns, Maury Povich, Mike Pintek, John Fedko, John Schumway, and Larry Richert. Pudgie Wudgie received honors from the many people that he met. George Straduhar wrote the “Pudgie Wudgie Polka” as a tribute to his feline friend. Pudgie has a brick with his name inscribed on it at PNC Park and another at the Animal Rescue League in Pittsburgh. In 2004 he was inducted into the West Virginia Pet Hall of Fame. He is also featured at the Western Pennsylvania Sports Hall of Fame at the Heinz History Center. 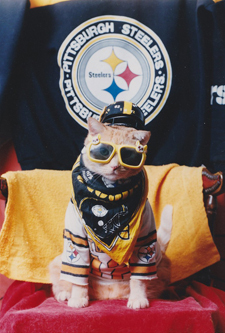 Pudgie was a Steeler fan and a regular at many tailgate parties. His picture hangs in the hall alongside Myron Cope. For fourteen years, I had the pleasure of serving as Pudgie’s assistant. He was the ultimate star no matter where he appeared. Everywhere that he went, he made people smile. I never dreamed that the tiny kitten I brought home in 1986 would have brought to much joy into this world. This book is the story of Pudgie Wudgie told through pictures. This introduction was taken from the limited edition publication Fourteen Years with Pudgie Wudgie, Verona, PA : Rogers & DeTurck Printing, c2006. A copy of it can be found in the Allegheny County Library System, along with a VHS recording called Pudgie Wudgie and Frank of some of Pudgie’s performances and appearances. Select photos from Fourteen Years with Pudgie Wudgie can be seen on our Gallery page.